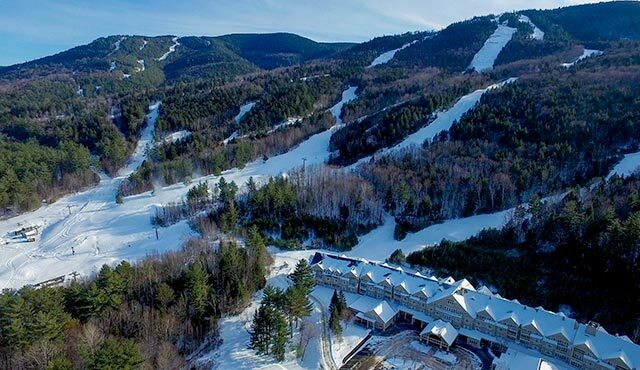 Bartlett, NH – Attitash Mountain Resort will kick off the 52nd winter season on Friday, December 16, 2016. Mountain officials report that both mountain peaks, Attitash and Bear Peak, will open on Friday with top-to-bottom skiing and riding on over 100 acres, accessible by 6 different lifts. Options for all abilities will be available. The Bartlett based resort projects that by opening day, 25 fully-groomed trails will available offering 105 skiable acres serviced by 6 lifts. Crowd favorites such as Saco, Ammonoosic, Cathedral, Northwest Passage and Far Out are planned for Attitash while Bear Peak will offer Illusion, Morning Star and Snowdancer, to name just a few. Resort officials reported that the two mountains will be connected via the Far Out and Snowdancer connector trails and will also offer access to the ski in / ski Grand Summit Hotel located at the base of Bear Peak. For skiers and snowboarders looking for lessons or to refresh their early season skills, the Learning Center beginner area will be available this weekend with lessons and rentals obtainable via the Adventure Center at the base of Attitash. Terrain park elements will be available on Lower Illusion on Bear Peak and additional smaller terrain features will be set up between the Bear Peak base lodge and the Flying Bear Quad Chairlift. Terrain features will transition by the holiday week to the newly designed Abenaki Terrain Park located on Mythmaker and Kachina with a goal to have jibs and jumps across three parks by Christmas morning. Lift tickets at Attitash Mountain Resort will be available on Friday at the ticket window for $75.00 for Adults (ages 18-64) while Youth (ages 7-17) Lift Tickets will be at $54.00 per day. Discounted multi-day tickets and E-Tickets are available online at www.attitash.com. This weekend’s events include “Ski With Santa” on Saturday, December 17th from 9:30 a.m. to 2:30 p.m. as well as the “International Women’s Ski Day” from 9:00 a.m. – 4:30 p.m..
At nearby sister resort Wildcat Mountain, officials report that after 12 inches of new snow this week, packed powder primary conditions and top-to-bottom skiing and snowboarding options are available on over 75% of groomed and ungroomed terrain. Tickets at both Attitash and Wildcat are interchangeable at anytime while valid.